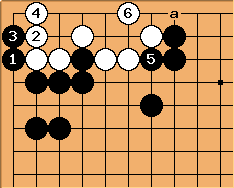 What is the best possible outcome for Black? This looks like white lives, but is 5 necessary to kill? If black connects in the corner with 5, can white make two eyes on the right? I would guess that maybe white 6 at 5 would then be alive? 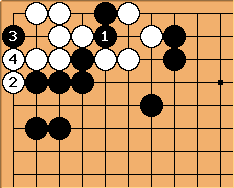 In the actual game, I played 1 at 3 (hane) with the obvious response at 6, then 3 at either 4 or 5(?) I eventually killed but I am convinced white made mistakes. Both white and I were (are) low level players. I would guess that maybe white 6 at 5 would then be alive? Dieter: I could answer this but I think it is better for you to read it out then make a firm statement. 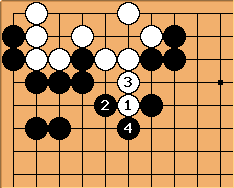 What happens after White's descent is indeed a cool kyu-level problem. 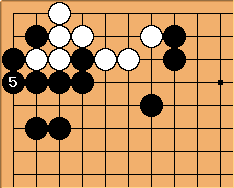 The first thing to note is that if Black saves his corner stones with , White will be able to live on the right. 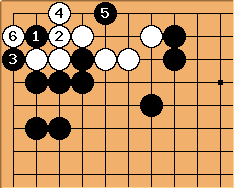 More interesting is to note that even with , White doesn't have an eye in the corner yet : Black can fill with at , then captures and can be at again. 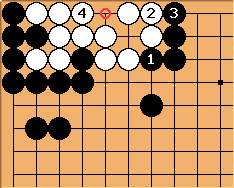 Now Black threatens to play and remove the eye in the corner (after White captures the two stones Black throws-in at again and it's a false eye), therefore White must play at herself to complete the eye — in gote. 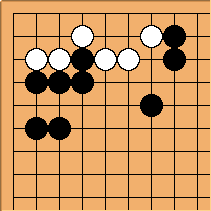 I think this lives because if connects at 'a', at 'b' makes two eyes, one at E19 where black is eventually captured and one at F18. 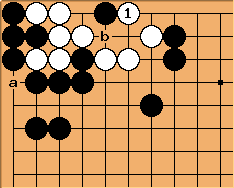 Black at b just loses the corner group and white must eventually capture the invading stones for a second eye. 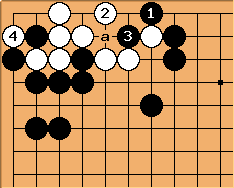 Now regarding the Hane — following the proverb Hane, Cut, Placement, the hane is usually a working killing technique. 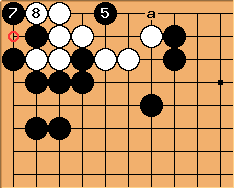 lives, because White's able to make a second eye at either a or b. 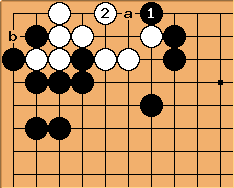 Finally, given that white's alive and the clamp is bound to be gote, I think that this is the correct endgame play. 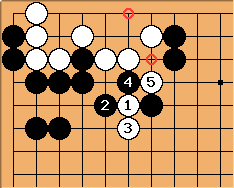 The area around a is gote for Black so White's likely to have to play there first. Then allows to close off the middle without too much bad aji.